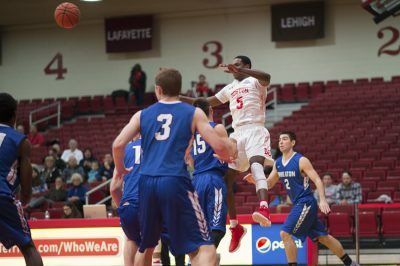 Freshman forward Walter Whyte quite possibly returned for the Boston University men’s basketball team’s most-needed game of the 2017-18 season. The New Haven, Connecticut native was just another in a series of injuries that have plagued the Terriers (13-15, 9-8 Patriot League) this season. Whyte returned to the court Wednesday night after missing four games, in which BU had continued to accumulate a five game losing streak. However, the freshman put up 14 points alongside freshman guard Javante McCoy’s career-high 21, and the Terriers effectively completed their first regular season sweep with a 81-65 win over Lafayette College at Case Gym. While the Terriers grabbed the win in their final home game of the regular season, the contest began much differently. The Leopards (9-19, 7-10 Patriot League) took a 41-36 lead at the halfway mark before BU exploded offensively in the final 20 minutes, outscoring Lafayette 45-24. This was a positive change of pace offensively for the Terriers, who were recently limited to just 48 points against the United States Naval Academy last Saturday. BU led the game for the first five minutes after two three pointers from senior guard Cedric Hankerson and McCoy as well as field goals from sophomore forwards Max Mahoney and Tyler Scanlon. The Leopards knotted the game at 13 with a layup from forward Paulius Zalys, who led his team with 11 points over the first half. Senior guard Eric Stafford added a layup to extend Lafayette’s lead, which the team proceeded to keep for the remainder of the half. At 6:11, the Leopards led by as many as 15 points. But four and three points from Whyte and McCoy, respectively, cut the Terriers’ deficit to five points before heading into the locker room at half time. Five of BU’s players tallied six or more points during the first. The momentum shifted in the second half for the Terriers as they opened frame with a 17-2 run within a six minute timespan. This run gave BU a lead it would hold onto until the end of the contest. The Leopards got the score within a five point margin twice, but the Terriers appeared unstoppable and led by as many as 27 points with 3:48 remaining. During the second half, BU shot 54.6 percent (18-for-33) from the field and 47.1 (8-for-17) percent from behind the arc. The Terriers also converted Lafayette’s 13 turnovers into 21 points during the frame as well. McCoy led all players in points, while Hankerson, Mahoney and Whyte notched double-digit scoring.